This coming Sunday over a thousand people will be running Coventry's Half Marathon. Several of us from church will also be running. We are using this occasion to do something different and take church onto the streets. The race starts at 9am and we have a great spot (2 mins walk from Mill St) about 1.5 miles out from the start and a mile from the finish line. See map for details. 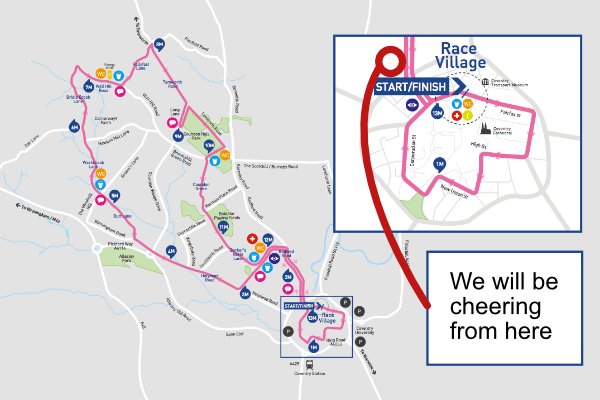 The runners will be leaving the city along the Radford road and returning the same way, so we will gather outside the main fire station to make lots of noise, cheer, clap, play inspirational/motivational songs and waving banners! After the half marathon we will gather at our Mill St venue for a 'bring and share lunch'. There will be limited parking at Mill St and we have also got permission to park at the Radford Fire Station, (access from Abbots Lane). Come and join in the fun but give yourself plenty of time to arrive as there will be road closures to all traffic.